After our unpleasant journey on the bus from Siem Reap to Phnom Penh, Cambodia, I made sure to dig in a little bit more this time and find a reputable bus company to take us from Phnom Penh, Cambodia to Ho Chi Minh City in Vietnam. It was more important for this bus ride to go smoothly because it involved crossing a border. Luckily, a kind gentleman on Trip Advisor had shared his extensive experience comparing the different bus companies that do the trip. 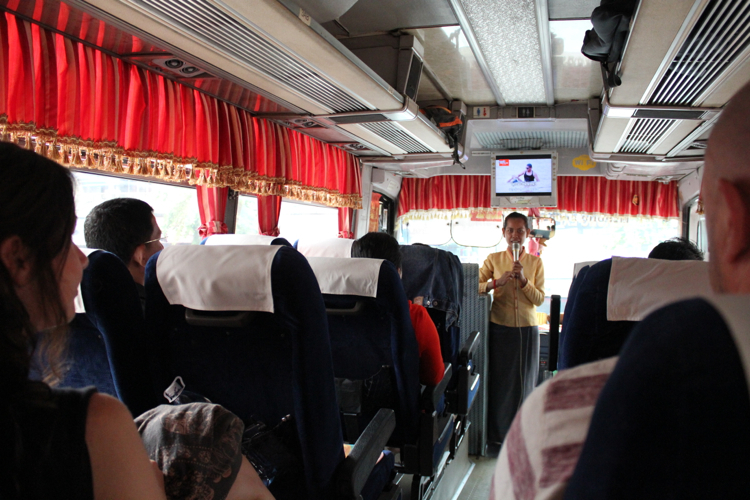 We followed his advice and took the Mekong Express Limousine Bus. My goal used to be “travel as cheaply as possible”, but I take that back. Comfort and service are worth paying a few extra dollars for. 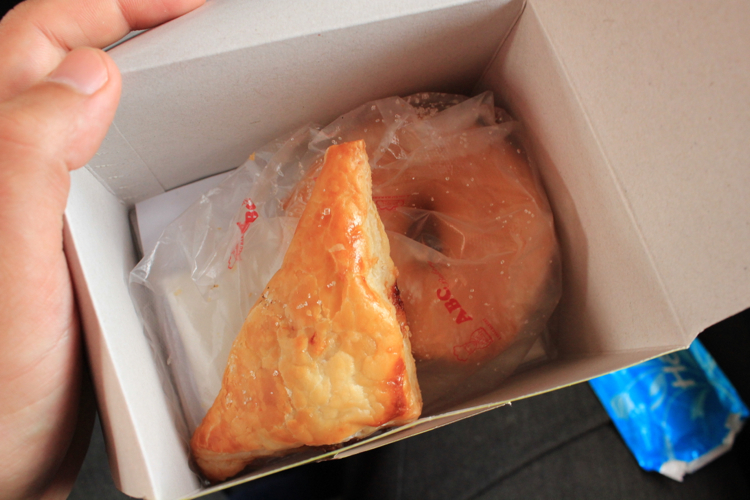 Plus $13 USD for a cross border, 230 km bus ride wasn’t exactly breaking the bank. 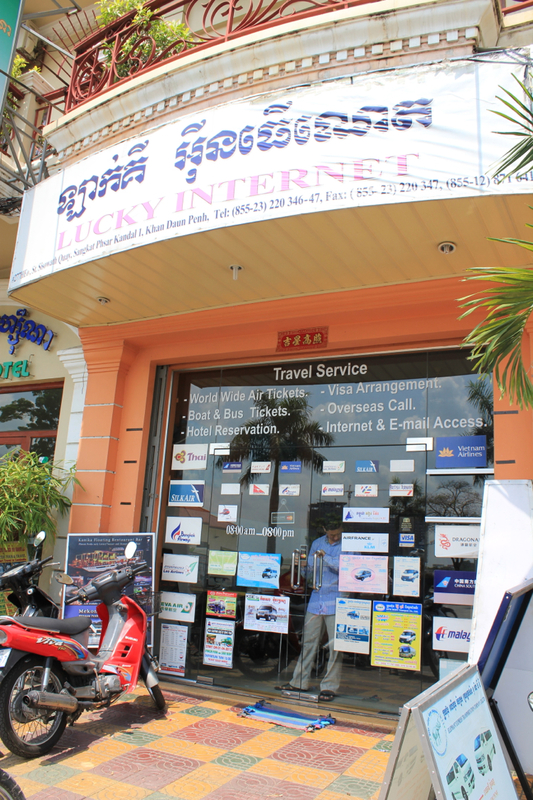 All hotels/guesthouses in Phnom Penh seem to double as travel agents as well. 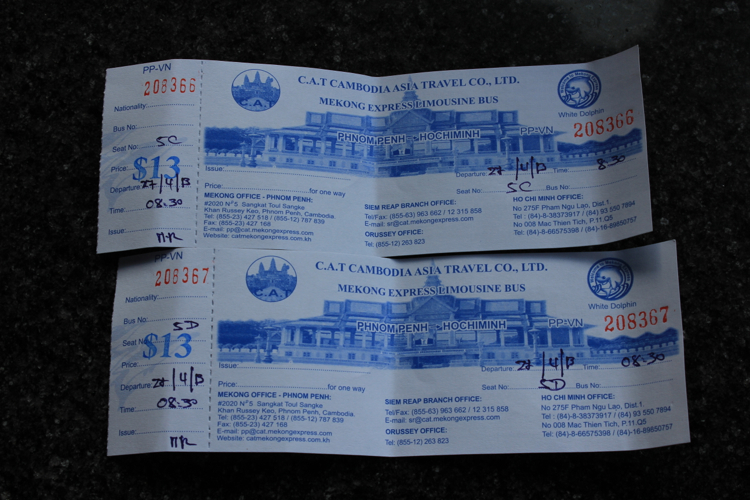 We asked our guesthouse about a bus from Phnom Penh to Ho Chi Minh City and were quoted $13 USD, but it wasn’t with Mekong. 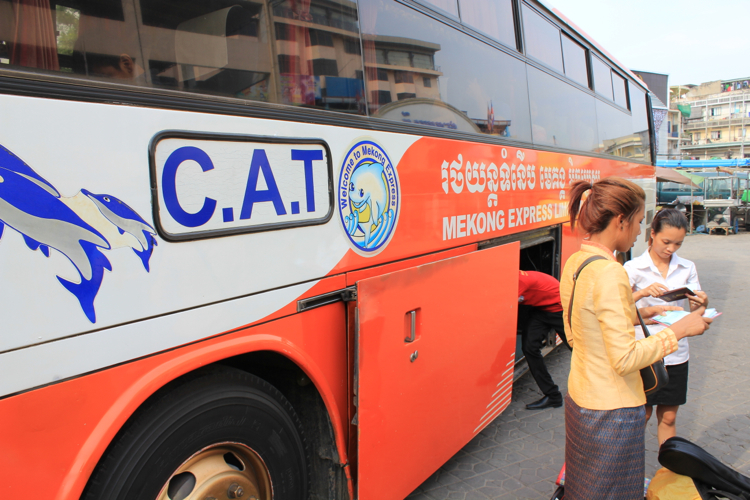 According to the interwebs, Mekong is one of the few companies that does not pay a commission for referrals, so guesthouses would much rather promote other bus companies for kickbacks. 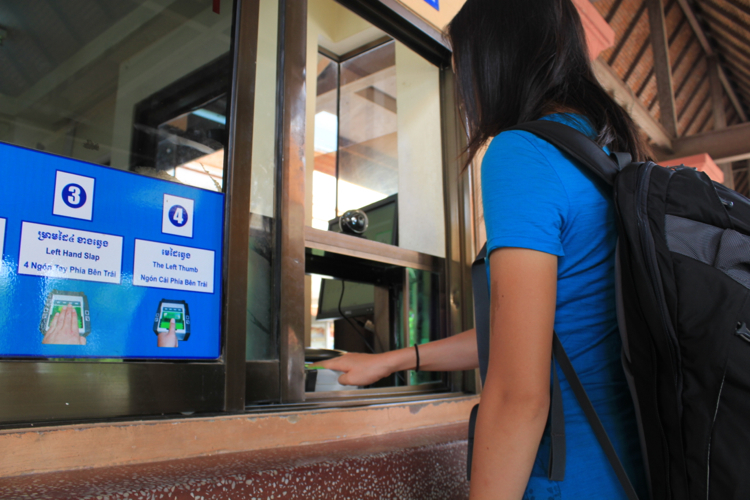 You could insist on getting a Mekong ticket, but you could fall victim to the guesthouse pulling a switch on you. Phsar Kandal I, Khan Daun Penh. 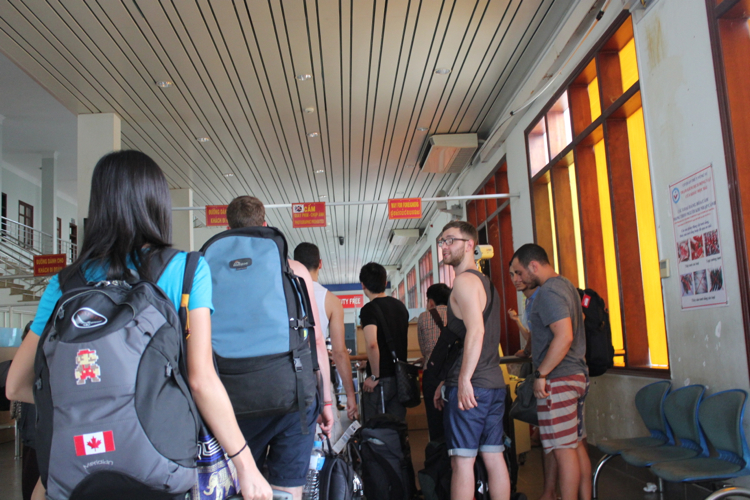 We chose the 8:30 am bus, and waited at our guesthouse for the shuttle to pick us up. As usual, we were a little concerned when the shuttle was late, but no problem in the end. The shuttle came, the driver and assistant were very polite and put our luggage onto the minivan for us. 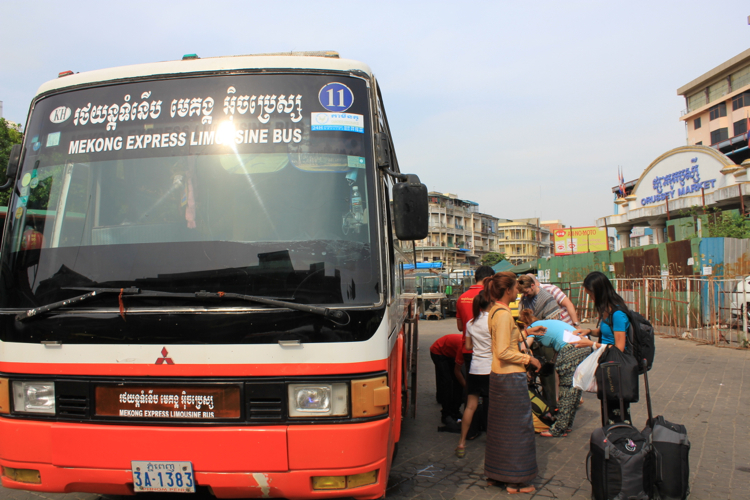 We proceeded to pick up several other passengers, and were then taken to the bus station at the ORussy Market. 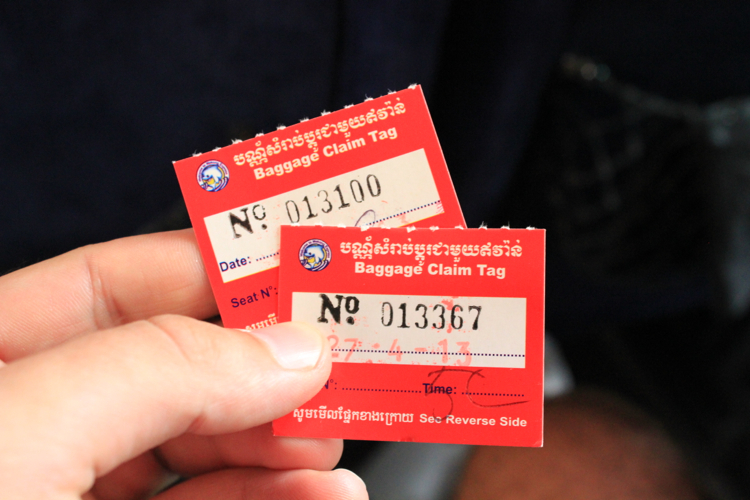 Here, the nicely uniformed attendants checked our bus tickets, made sure we had our Vietnam visa, and tagged our luggage. I was quite happy with how organized they were. It is important for them to make sure that you have your Vietnam visa ready, because there is no visa-on-arrival at the border. Some bus companies have been known to leave travellers at the border if they were unprepared. The bus departed at 8:45 am. I think she also told us about the border crossing process, and maybe even the weather! 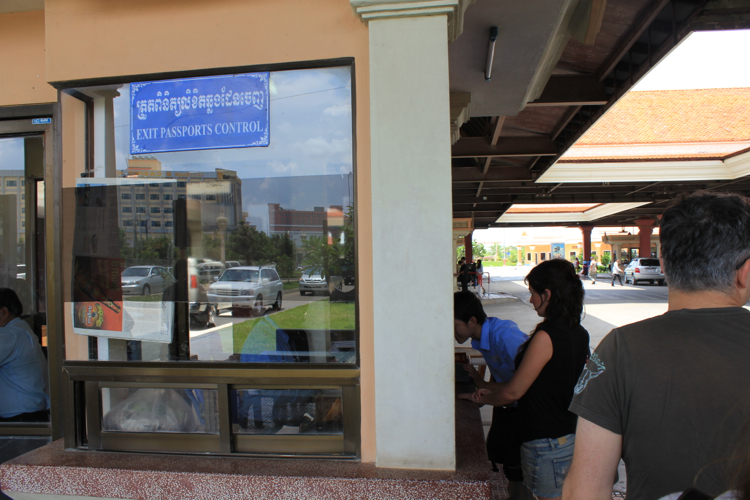 But it got more and more difficult to hear as the Khmer passengers behind us began to have a conversation very loudly. Wet towels were passed out, followed by a snack and a bottle of water. You know what blew my mind though?? There was free wifi on the bus!! It’s not very fast, but it was there and it worked! That was a pleasant surprise for those who are incapable of disconnecting themselves from the grid (aka me :P). The wifi only works while you are in Cambodia however, not that I’m complaining! 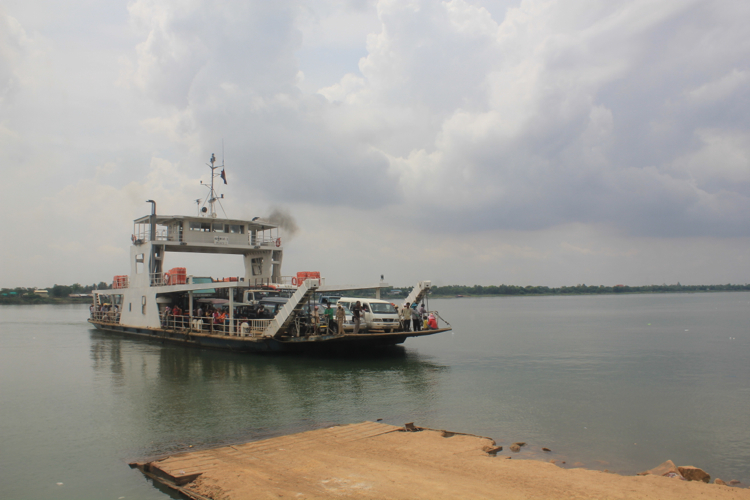 Around 10:00 am, we came to the ferry crossing at Neak Loeang over the Mekong river. At noon we arrived at a restaurant and were given 20 minutes to grab a quick lunch and to use the facilities. 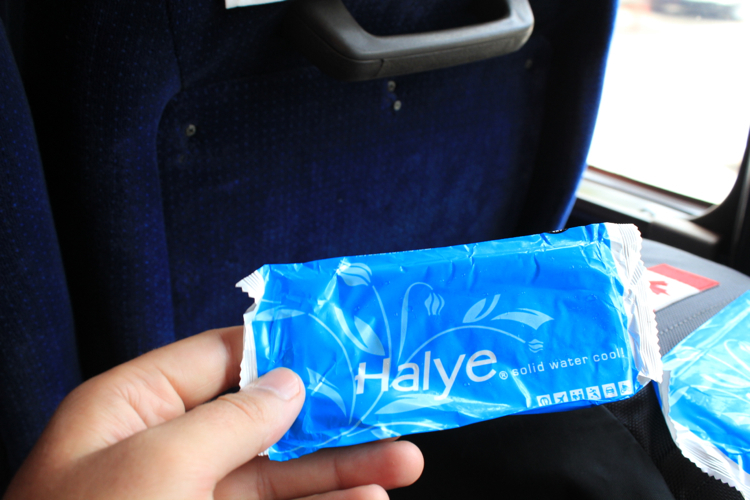 Although I must say, the toilet on the bus was quite clean. It didn’t have any water to wash your hands with, but it did have toilet paper. Side note: You can see in the picture above that everyone lined up at one window, but you can also go to the window to the left, and to the next booth off in the distance. You cannot however, go beyond that second booth. On our way back to the bus, the attendant collected all our passports once again. 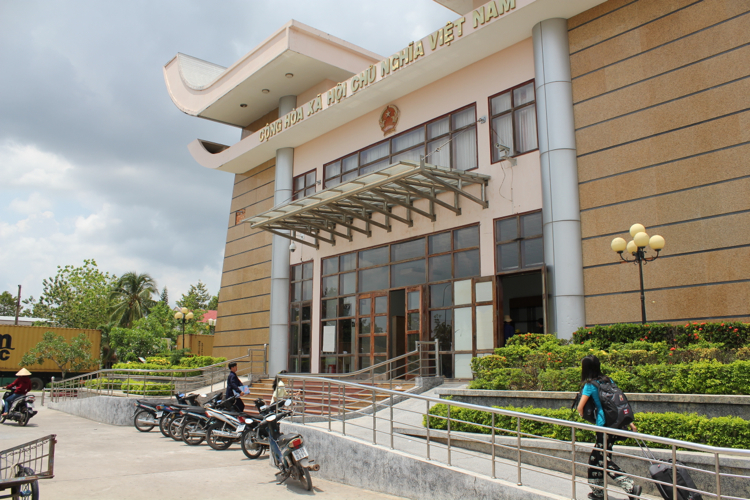 Another very short ride and we arrived at the Vietnamese customs and immigration building. At this point you were asked to take all your belongings and luggage with you. When we got inside the immigration office, our bus attendant was already at the front of the line with all our passports. We all stood around until the attendant called out our names. Whatever it was that had to be done, she did it for us! So don’t worry about trying to get in line quickly or feel the need to push your way through. One last immigration agent checked our passports again and off we went! But our bus was still being searched, so here’s a tiny bit of down time to contemplate life. Make sure you don’t get too flustered and hop onto a different bus! Two passengers almost lost their luggage because they handed their backpacks to a bus staff loading a different bus. The bus staff took them without question because he does not know who belongs on the bus. Luckily Adam called out to them and said that our bus was still being searched, so they managed to get their luggage back before this other bus drove off! 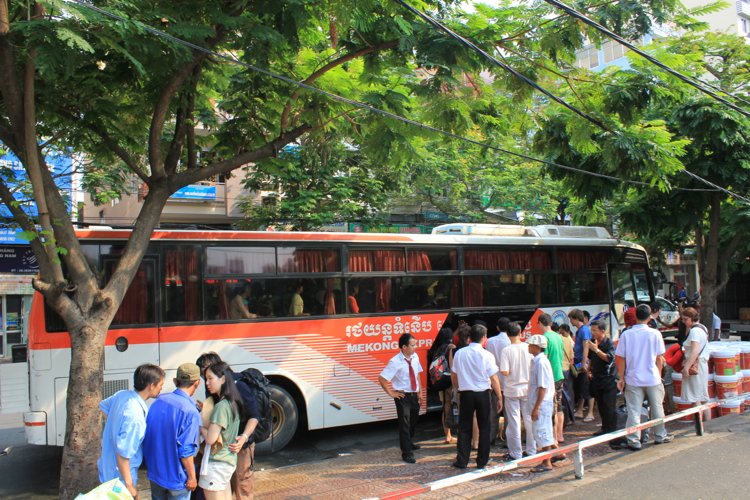 It was a perfectly reasonable mistake to make, as it seems that a lot of these cross border busses tend to switch to another vehicle at the border, but Mekong was not one of them. We were on our way again at 1:00 pm, and arrived in Ho Chi Minh City, Vietnam around 3:00 pm. Be prepared for a swarm of touts as soon as you step off. There’s no such thing as personal space with these guys. 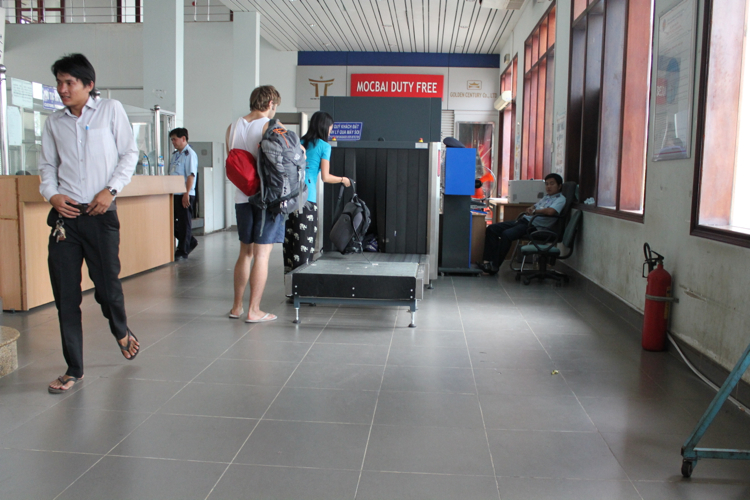 The final part of our bus trip was to collect our luggage, and this was where Mekong impressed me the most. All the suitcases and such were being off loaded by a bus staff. When I went to grab mine and made to get the hell out of the tout-zone, one of the bus attendants nearly ran over to me and asked for my luggage tag. She was perfectly polite about it! But I loved that they were keeping an eye on everything to make sure some random person didn’t run off with your luggage. 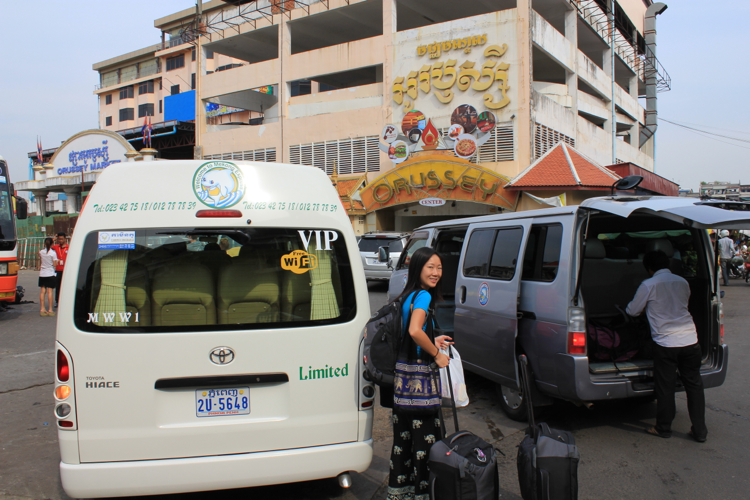 For $13 USD, our journey from Phnom Penh, Cambodia to Ho Chi Minh City, Vietnam was a fantastic experience. 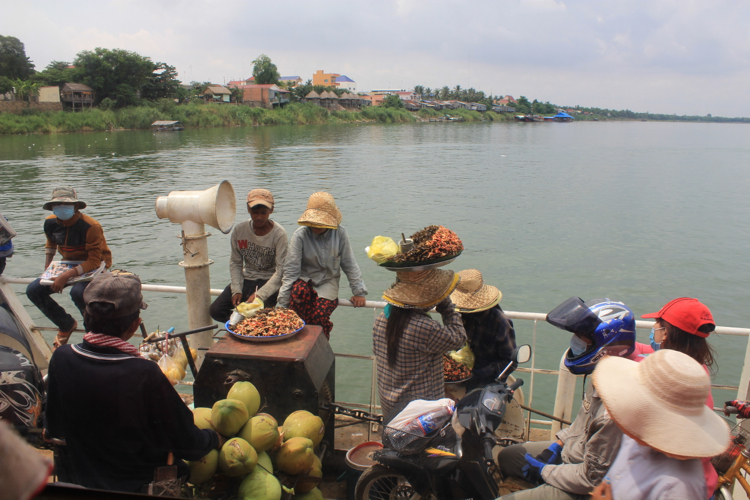 I also used Mekong to travel between Vietnam and Cambodia and agree that although the ride was long, i was as pleasant as it possibly could be! Agreed! It probably could’ve been much worse! Hi, you said you bought your visa from a travel agent for $57, did you have to pay a ‘stamping’ fee also at the Vietnam boarder? Nope no “stamping fee”. The bus stewardess person took care of everything for us. She took everyone’s passports as we went through immigration on both sides. Thank you very much for the above information which is very useful to us as we are planning our next trip in February 2014. 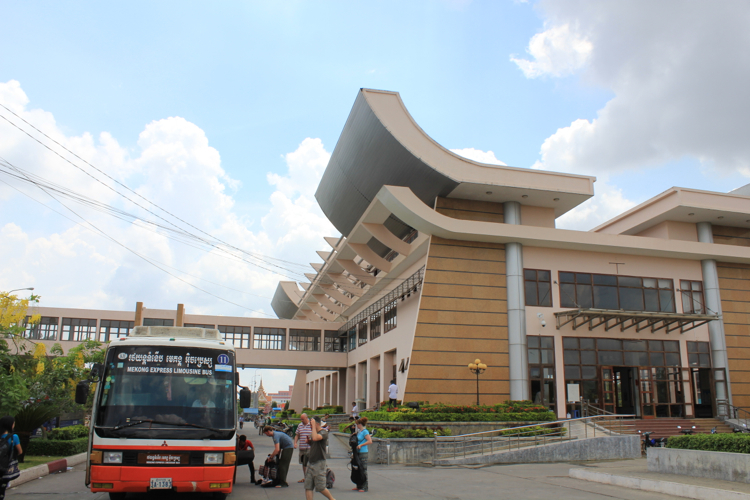 Do you have information of the return journey from Ho Chi Minh to Phnom Penh. Hi Pauline! We didn’t do the return journey ourselves, but I just checked Mekong Express’ website and it looks like they service the return route as well! From Ho Chi Minh City, you have the option of going to Phnom Penh, Siem Reap, or Sihanoukville. I highly recommend Mekong after having been through several less reliable bus companies in both Vietnam and Cambodia. I assume/hope the service will be just as good from HCM -> Cambodia. Thank you for this report as this is by far the best and most informative one I have seen. Well done! My fiancee and I will both be flying into HCM city in a week and we will be taking the opposite trip from HCM to Phnom Penh. We will be taking the Mekong Express thanks to you! My fiancee is Filipina so thankfully I will only have to pay the Vietnam visa for just me because Filipinos don’t have to have visas to enter Vietnam 🙂 Anyway, I just wanted to say how much I enjoyed your report and thank you for posting this for us all to see and learn from. Thank you very much for the kind words Troy! I’m very, very glad that this post has been helpful 🙂 I wish you and your fiancee a wonderful trip!! Hi! Thank you so much for sharing your experience. I’m about to do the same in December and I was asking myself how long does it take for the agency to provide you the Vietnam Visas? If we just stay one night in Phnom Pehn, is it enough? Hi Ines! In Phnom Penh, it took us one day (24 hours) to get our passports back, so you should be ok with one night in the city, as long as you have a full 24 hours there. I believe there are also express options if you’re willing to pay more. I don’t know how much more is expected though. Keep in mind that weekends are closed. Safe travels! hii julie. thanks for the information, im planning to go to vietnam from cambodia using the Mekong Express. But i do hv a question about the visa on arrival. because i’m an Indonesian passport holder that seem i got a 30 day of VOA. Can i pass the border without preparing my visa? if you dont mind I wanna ask you something, is there a bus from Phnom Penh to Ho Chi Min City start at night? Hi Julie, really thank you for such a detailed info on your bus trip to HCM. Already bought Asia ticket to PP for 10days and plan to do the bus trip PP-HCM -PP. So far, the BEST post I have ever read, very informative. Will definately follow your advice…thank you! God Bless You! Thanks for the update Owen! Muchly appreciated! First start off by saying what. Fantastic article. I am planning to travel from Vietnam all the way through to Burma. Is there buses or trains that would allow me to cross the boarders? That sounds like a great trip!! I’m afraid I’m not familiar with any busses or trains to Burma though. Thank you soo much for this information. I printed this out for reference. I’m planning on going to Vietnam next month, and I’m thinking of visiting a friend near Phnom Penh first, and then taking the Mekong express to Ho Chi Minh City. I’m only 19 and blonde and very obviously a foreigner though and I would travel by myself. I have to admit I’m kind of scared because I’ve never been to any of the countries. I’m meeting another friend in Ho Chi Minh City so I would only be alone during the bus ride and I was just wondering if you think that it would be safe for me to travel alone from PP to HCMC? Very informative post! I had made my plans for this vacations to Vietnam. This will help me a lot. Hi, Do you have any “must checkout” places in Ho Chi Minh? My friend and I are going in October 2015 and are renting motor bikes when we arrive to explore on our own. Any bike rental shops that are the best and reasonably priced? Just having the experience of scootering or walking around the city will be the best thing to do there. Although there are a lot of ‘recommended’ places to visit, we found that stumbling across random buildings with impressive architecture, hopping’ little restaurants or the numerous markets was the most rewarding. All the bike shops we came across were more or less the same, and you shouldn’t be paying much more than $5-$10 american per day, and avoid giving them your passport at all costs. I took the morning 8.30am Mekong Express Bus from Phnom Penh to Ho Chi Minh.But the bus that I took today they had a few stopped at the half way to pick up some passengers from the road side.They spent at least an hour to pick up the passengers from the road side. This is not an express bus company.Departure from 8.30am and we are still at the Vietnam boarder immigration which is 2pm now. Enjoyed reading your post. It is very informative, it is really helpful as I am planning a Phnom Penh-Ho Chi Minh trip in 2016. Am considering Mekong Express and Giant Ibis. This was exactly the info I was searching for, great! This is SUPER helpful. And just checked online- the price only went up 1 dollar since you wrote this (awesome)! Thanks! 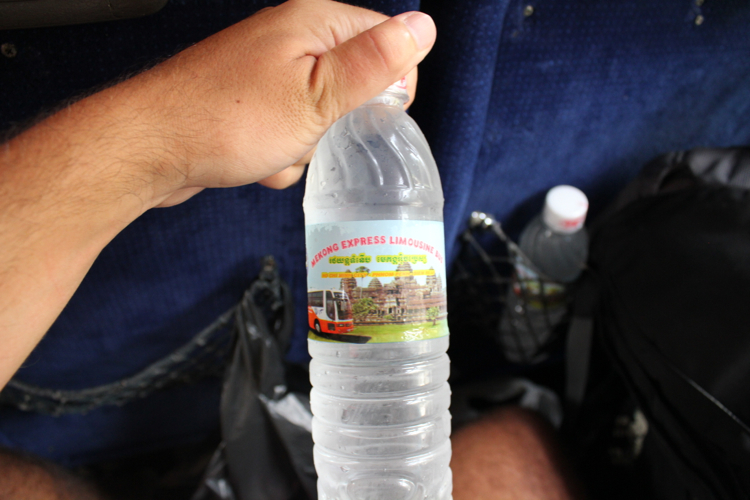 A really comprehensive blog on the Mekong Express bus ride. I am planning to do the trip in Sep and am truly grateful for the very useful information. This is no the best option ! Vietnam embassy is very close, just 40 minuts walk from phnom penh center, so u dont need to pay 57 dolllars bc at the embassy just pay 40 dollars and u have the visa next day. It is very easy ! The ticket to Ho chi minh is 9 dollars at the agency just you need to ask !! I write this bc I am tired to read travel blogs and they say ” oh everithing is fine , everithing is cheaper an fantastic , is very easy and the people is friendly!! ” if u want something u need to go for yourself and dont believe in blogs ! Thank you Julie for the very informative blog, me and my sons will be visiting Cambodia and Vietnam by next month and surely be guided by this info of yours. Hope we could find a nice ride from Siem reap to Phnom Penh then HCM(Saigon) and Hanoi.. as our entry is in Siem reap airport then going to PP-HCM(saigon) from where we expect a long ride to Hanoi airport back to the Philippines. Hi. 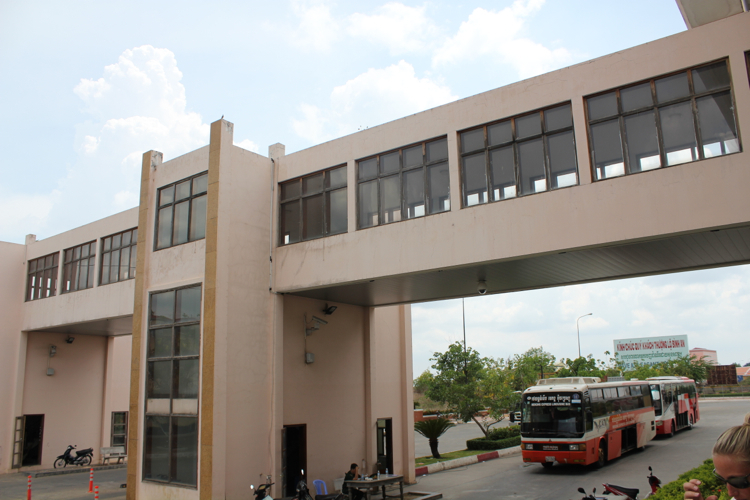 Evisa for vietnam is allowed if you are traveling from cambodia to vietnam in a bus? Or do you recommend to get the visa done by the bus agency itself? Hi Julie – great post! How many days do these companies need to process your visa? I am an American planning to visit PP for a few days before taking the bus to Ho Chi Minh – should I worry about securing a visa before I leave the states, or just get this handled in Phnom Penh? My memory is fuzzy, but I remember it being very quick. I want to say 2 days? But it may have been even quicker than that, overnight even.